Picket the Union-Busting Freedom Foundation! 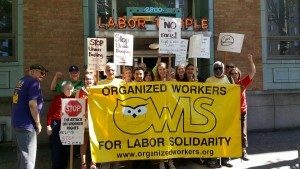 Organized Workers for Labor Solidarity (OWLS) will picket the Freedom Foundation’s annual fundraiser on September 23, from 5-7pm in front of the Bellevue Westin at NE 6th Street and Bellevue Way NE. The picket will protest the Freedom Foundation’s racist rightwing agenda that openly declares its goal is to “defund and bankrupt public employee unions.” OWLS is organizing the picket to defend the labor movement and public services, and to raise public awareness around the anti-worker agenda of the Freedom Foundation. On July 29, the Freedom Foundation won a favorable decision from the Thurston County Superior Court that orders state agencies to turn over names, birthdates, and work email addresses of all employees in public sector unions to the anti-union group. In court, the Freedom Foundation announced plans to use the information, coupled with voter registration records, to get individual home addresses so state workers can be contacted at home and pressured to withdraw from their unions. Several unions joined in an appeal to block disclosure. The Freedom Foundation has financial and political ties to conservative billionaires. Their goals include rolling back wage, labor and anti- discrimination legislation, environmental protections, LGBTQ and women’s rights, and blocking any tax on wealth to fund public services. The picket will educate about the Freedom Foundation’s reactionary agenda and build solidarity for labor self defense. Unions and community organizations are invited to participate and endorse the picket. To endorse, email OWLS at OWLS@riseup.net or call Jay Herzmark at 206-947-7012.